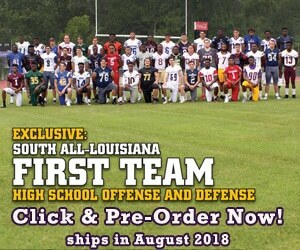 Check out today's player spotlight on Brother Martin senior OG and Louisiana Monroe signee Zachary Breaux! Check out today's player spotlight on Central Lafourche senior WR and Nicholls State signee David Robinson Jr.! Check out today's player spotlight on Sulphur senior DT and Southern Arkansas signee Slade Manlief! Check out today's player spotlight on Scotlandville senior DB and Tulane signee Dorian Camel! Check out today's recruit spotlight on St. Thomas More senior RB Chris Primeaux! Check out today's player spotlight on Woodlawn (Shreveport) senior RB Trivenskey Mosley who will sign with the Southern Mississippi Golden Eagles! Our very own JBriaan Johnson caught up with John Curtis senior FS Cade Comeaux as he talked about playing for J.T. Curtis, the different positions he has played since high school, what he wants to prove the most at Ole Miss, and so much more in today's signee spotlight! 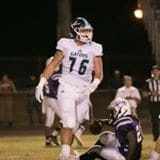 Check out today's player spotlight on Ascension Episcopal senior OT and Tulane signee Michael Remondet!